Have a family member who is impossible to shop for? Why not take car care off their plate and give them the gift of extra time for friends, family, and holiday festivities? With Christmas just around the corner, now is the perfect time to start thinking about gifts for friends and family who seem to have everything. Spiffy Blue is the perfect option because it lets them worry less about car maintenance and focus instead on the important things. Here the top 5 reasons why a Spiffy Blue car health monitor is an awesome present for the holidays and beyond. Technology buffs will love the Spiffy Blue app that decodes check engine lights and sends notifications straight on their phone. Our cloud-based mobile application for iOS and Android receives continuous updates thanks to customer feedback and is connected via your phone’s Bluetooth for on-board diagnostics straight from your engine. It’s like a Fitbit for your car! Spiffy Blue is the perfect gift for any loved one, especially teenagers and college students. Help them stay safer on the road by identifying recall alerts and resolution solutions. They’ll get informed when that check engine light is trying to tell them something important or when it's just time for an oil change. Spiffy Blue also keeps a log of service and maintenance and tells you when it’s time for scheduled repairs. Is there a worry wart on your nice list? Spiffy Blue gives users peace of mind by immediately showing important information, putting them at ease that all systems are a go. Let them take control of car care by arming them with relevant information that helps them make the right call for their vehicle maintenance. 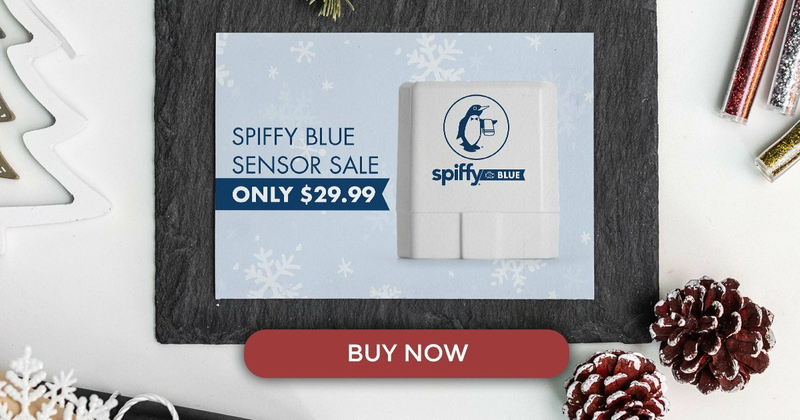 Not only is Spiffy Blue a great holiday gift, but it’s also a awesome value. Buy one for $39.99 ($29.99 Black Friday - Cyber Monday! ), or better yet -- two for $49.99 or three $59.99. Your purchase includes free access to our exclusive Spiffy Blue app for Android or iOS to keep you informed wherever you go. Spiffy Blue was recently named one of the Best OBD2 Scanners of 2018 by Motor Day! Ready to help your loved ones take control of car care? Click to purchase Spiffy Blue today!